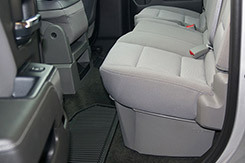 Every DU-HA is custom designed to fit a particular model of truck. 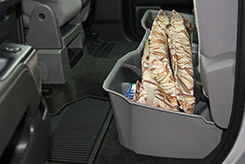 The DU-HA for the 2014-2019 Chevrolet and GMC Silverado/Sierra Double Cab is designed to fit underneath your pre-existing back seat. 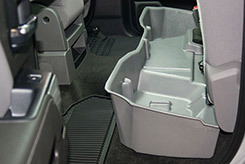 It's constructed from heavy duty polyethylene and has a lifetime warranty. This model acts as a legal gun case in most states and will hold up to 2 shotguns or rifles, without scopes. The back door of this truck measures 30-1/2" wide. If it measures 30-1/2" wide, you have a Double Cab and you are on the right page. Scroll down to see the DU-HA for your truck. If your back door measures 40" wide, you have a Crew Cab and you are on the wrong page. 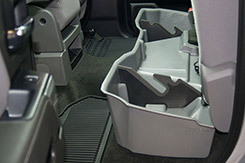 The DU-HA fits underneath the pre-existing back seats of your truck. The DU-HA will hold larger items without the organizers / gun rack installed. Every DU-HA includes the organizers / gun rack at no extra charge. These assemble quickly and are also easily removable. 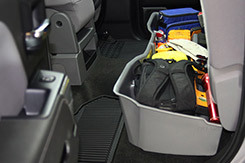 Store your gear and valuables safely out of sight under your back seat. This DU-HA will hold 2 shotguns or rifles without scopes. 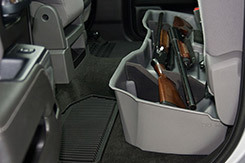 By placing your rifles and shotguns in DRI-HIDE gun protectors first, then placing them in the DU-HA, you create the perfect environment for storing your guns in your truck. 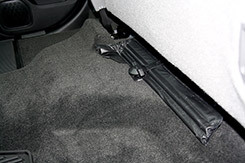 The Dri-Hide's allow moisture to evaporate out - not in, which helps protect your guns from rust and corrosion. The DU-HA is available in matching factory interior colors, so it blends in seamlessly with your trucks interior and keeps your valuables hidden from prying eyes. To install this model, temporarily remove the jack tool back (by unscrewing the wingnut) from under the back seat. This will reveal a threaded stud which will fit up through the pre-drilled hole in the back center of the DU-HA. Reinstall the jack tool bag (by tightening the wingnut) on top of the exposed threaded stud and the DU-HA. 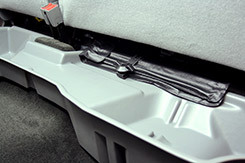 Lower the bottoms of both sides of the back seat to return them to their original position and installation is complete. This model of DU-HA is available in matching interior colors. Part # 10304 - Jet Black is pictured above. Part # 10305 - Ash/Gray is pictured above. Part # 10306 - Dune/Tan is pictured above.